a sphere of activity [influence] 活動[勢力]範囲. He's active in many spheres. 彼は多くの分野で活躍している. ⇒the MUSIC of the spheres 【成句】. Politics are out of my sphere of interest. This area was formerly within the sphere of influence of the US. (mathematics) A regular three-dimensional object in which every cross-section is a circle; the figure described by the revolution of a circle about its diameter [from 14th c.]. Of celestial bodies, first the sun, / A mighty sphere, he framed. So your orientation changes a little bit but it sinks in that the world is a sphere, and you're going around it, sometimes under it, sideways, or over it. Though cold and darkness longer hang somewhere, / Yet Phoebus equally lights all the Sphere. It is more simplicitie to teach our children […] [t]he knowledge of the starres, and the motion of the eighth spheare, before their owne. They understood not the motion of the eighth sphear from West to East, and so conceived the longitude of the Stars invariable. They thought – originally on grounds derived from religion – that each thing or person had its or his proper sphere, to overstep which is ‘unjust’. 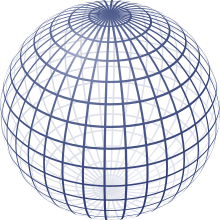 (geometry) The set of all points in three-dimensional Euclidean space (または n-dimensional space, in topology) that are a fixed distance from a fixed point [from 20th c.]. (transitive) To place in a sphere, or among the spheres; to ensphere. The glorious planet Sol / In noble eminence enthroned and sphered / Amidst the other. (transitive) To make round or spherical; to perfect. Designating some layer of the Earth.